As your development, test, sandbox, and demo environments begin to grow and consume more resources than anticipated, it’s difficult to quickly provision and scale up when you’re running out of data center space, power, and time. Moreover, when you run these environments on the same infrastructure, you run the risk of your developers stealing CPU, storage, and network resources from your mission critical workloads. 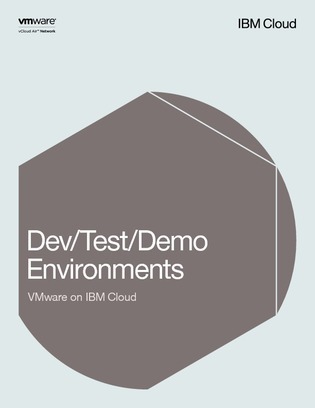 Read on to discover how to gain the agility and security you need to support rapid app development and testing cycles with VMware on IBM Cloud—which allows you to physically separate and extend your on-premises composite app development and test environments, as well as VMware deployments, to the cloud to achieve that scalability.